The Vega launch vehicle for Arianespace’s next mission has completed its build-up at the Spaceport, preparing this lightweight member of the company’s launcher family for final checkout ahead of its November 20 liftoff from French Guiana with an Earth observation spacecraft to be operated by the Kingdom of Morocco. 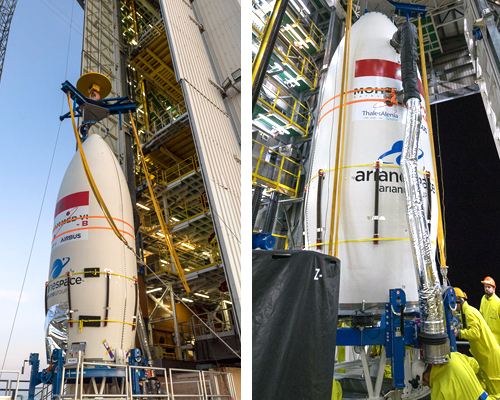 The “upper composite” with the MOHAMMED VI – B satellite is ready for hoisting to the upper levels of Vega’s mobile gantry (photo at left), where it was installed atop the lightweight launcher (photo, right). This activity concluded with the integration of Vega’s “upper composite,” which consists of the MOHAMMED VI – B satellite and its protective payload fairing. Installation took place at the Spaceport’s SLV launch site, in the upper level of the facility’s protective mobile gantry. Produced by Thales Alenia Space as system prime contractor and Airbus as co-prime, the MOHAMMED VI – B satellite will be deployed into a Sun-synchronous orbit on the upcoming Vega mission – which is designated Flight VV13 in Arianespace’s launcher family numbering system. The MOHAMMED VI – B satellite has an estimated liftoff mass of 1,108 kg. Once in orbit, it will be used primarily for mapping and land surveying activities, regional development, agricultural monitoring, the prevention and management of natural disasters, monitoring changes in the environment and desertification, as well as border and coastal surveillance. It is the second satellite for the Kingdom of Morocco’s MOHAMMED VI – A & B program, following Arianespace’s Vega launch of the MOHAMMED VI – A satellite in November 2017. Designed to be complementary, the two spacecraft will work together to enable faster coverage of zones of interests. Vega is the smallest member in Arianespace’s launcher family, joining the medium-lift Soyuz and heavyweight Ariane 5 to provide a full range of launch services for customers worldwide. Flight VV13 will be the company’s ninth mission of 2018. 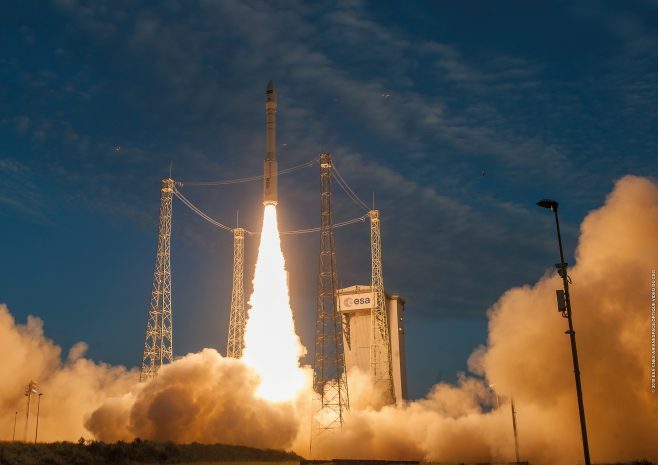 It follows the launches of five Ariane 5s, two Soyuz vehicles and one Vega so far this year. on Nov. 21 8:42:31 p.m.
on Nov. 20 2:42:31 a.m.
on Nov. 21 2:42:31 a.m.